As part of the From Australia With Love Blog Hop, Aussie YA author, Laura Catherine, talks about her paranormal romance novel, Djinn. 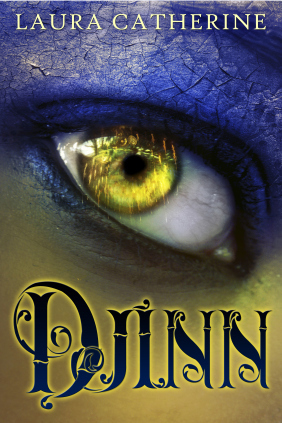 The first draft of Djinn was originally written in one month at 50,000 words as part of Camp NaNoWriMo June 2012. The first draft of book two: Blooders, was then written in the August 2012 Camp NaNoWriMo. Kyra’s father Malcolm was originally called William, and Will was originally called Jace, but I liked Will so much better for my main man so I changed it. Isabelle’s birthday is my Mum’s birthday, October 2nd. Siberian Husky is mine and Kyra’s favourite breed of dog. The idea for Djinn came to me while I was working at Bakers Delight. I was washing wires in the back thinking about how I wanted to write an original Paranormal Romance and then BAM the idea hit me. It flowed so easily and I had to run and get a paper bag to write on so I wouldn’t forget my ideas. The way Kyra and Malcolm work together in the kitchen, like a well-oiled machine, is the opposite of how my partner and I are in the kitchen, haha. Kyra’s middle name is Eliza. Will’s middle name is Henry after his father. The Djinn compound is based off a real suburb I drove through once where all the houses were exactly the same. I still have no idea where I was at the time, but the images of that place still remain. Pyke wasn’t originally a main character, but the more I wrote about him the more I realised what a complex person he was. Pyke had secrets and feelings I could never have imagined and he is by far my favourite character in Djinn. She's been on the run for as long as she can remember and her father is the only stable thing in her life, but everything changes when the people pursuing them finally catch up. Kyra is abducted by the handsome and mysterious, Will. He takes her to a secret compound where she is told the truth: She's a Djinn, a genie-like creature with super powers and a love of dogs. Kyra has to adjust to the Djinn and their rules, but her new life is far from perfect. Everyone is hiding something and the one person Kyra cares about most is forbidden to her. There are secrets around every corner and more dangers than Kyra could ever imagine as she struggles to find herself and be with the one she loves. Laura Catherine was born in Melbourne, Australia and spent most of her childhood creating fantasy worlds and talking to her invisible pet cheetah who ran along powerlines. Her imagination has carried her through childhood where her mother read stories about fantasy worlds at bedtime. Never one to face reality, Laura spent a lot of time turning boxes into ships and castles. In her High School years, Laura started to really consider writing as a career. All those notebooks full of story ideas finally had a purpose and in 2006 she started the first novel she would go on to finish 5 years later. The thrill of complete a novel from start to finish only inspired Laura more, soon she became a writing machine working on many novels and honing her craft by completing a Professional Writing and Editing Diploma in 2010. 2011 saw Laura get serious about becoming an author. She started her blog, Quill Wielder, and prepared her novels to be sent off to publishers. Still writing whenever she has spare time; Laura also participates in NaNoWriMo religiously to get her writing on. Laura has self-published her first novel, Djinn, a Paranormal Romance, and is working on the second in the trilogy, Blooders.